Turrialba Volcano decided to celebrate the Annexation of Nicoya national holiday with a bang Monday. At 7:22 a.m., the volcano sent a column of ash, rock and steam 3,000 meters high in its latest eruption. Volcanologists with the National University's Volcanological and Seismological Observatory of Costa Rica (OVSICORI) said winds would blow ash from Monday's eruption across the central valley. Turrialba Volcano sits 50 kilometers east of Costa Rica's capital, San José. Juan Santamaría International Airport in Alajuela is operating normally, according to Aeris spokeswoman Silvia Chaves. 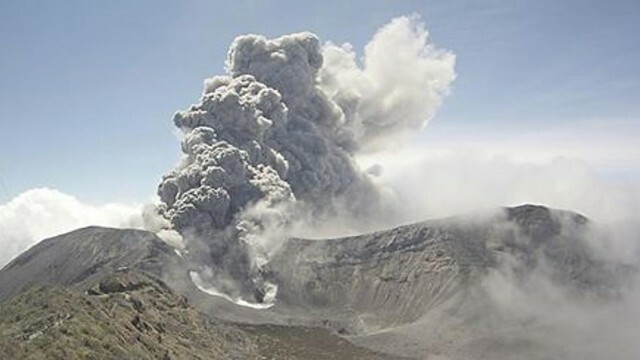 There were two "moderate" eruptions Sunday evening that each reached roughly 500 meters high. OVSICORI reported increased seismic activity at the volcano before Sunday's eruptions. Turrialba Volcano has been erupting sporadically since October 2014.